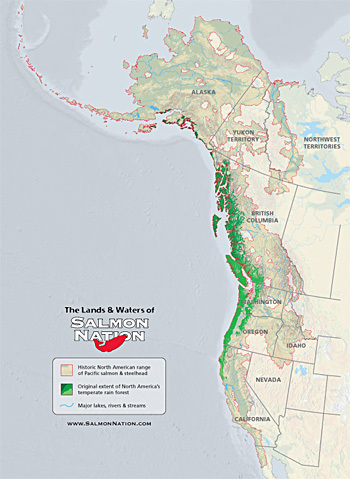 Salmon Nation is the region along the west coast of North America historically inhabited by wild salmon. From the Sacramento River in Central California up into Alaska, salmon — and their habitat — have defined this region. In recent decades, most of these salmon runs have declined, many of them precipitously. A top wildlife manager in Washington State once said to me that the salmon are failing because we’ve changed their habitat in ways that are forcing them to live in conditions outside of their evolutionary experience. The Portland, Oregon-based non-profit Ecotrust created the Salmon Nation meme, as a way for people in the region to identify with the iconic fish and be inspired to make the changes in how we live our lives that are necessary for the salmon to survive. Because we need what the salmon need. And a world in which salmon cannot survive is a world in which we won’t long survive, either. 2 Responses to What is Salmon Nation? to the altar of clear waters. on salmon flesh and salmon bone.